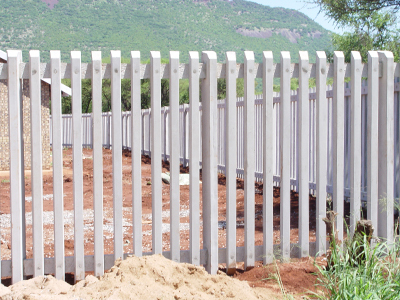 LFA is a well-established manufacturer of concrete palisade fencing and precast walling. We supply our concrete elements directly to contractors and the public, but most production is used by our own in-house installation teams. Being a Pretoria based company our installations are mainly in Gauteng and the surrounding provinces of Limpopo, Mpumalanga, North West and the Freestate. 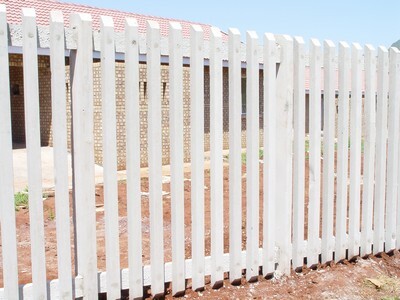 You will find ALFA Palisade fences next to national roads, around schools, sport stadiums, factories, suburbs and many other facilities such as pumping stations, reservoirs, and traction yards to name a few. Our palisade systems are available in either a 1.8m or a 2.4m high configuration; the 2.4m being most popular as security fencing. The steel reinforced concrete ensures that the product does not break easily and that a high level of security is achieved. 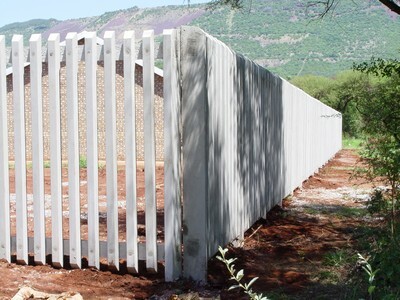 The fact that the fence is concrete, that it is very heavy (30 tons/100m) and virtually has no scrap value, also helps to keep concrete palisade fencing where it was erected. Manufactured to our high standard and erected with care our product will provide you with many, many years of superior service. 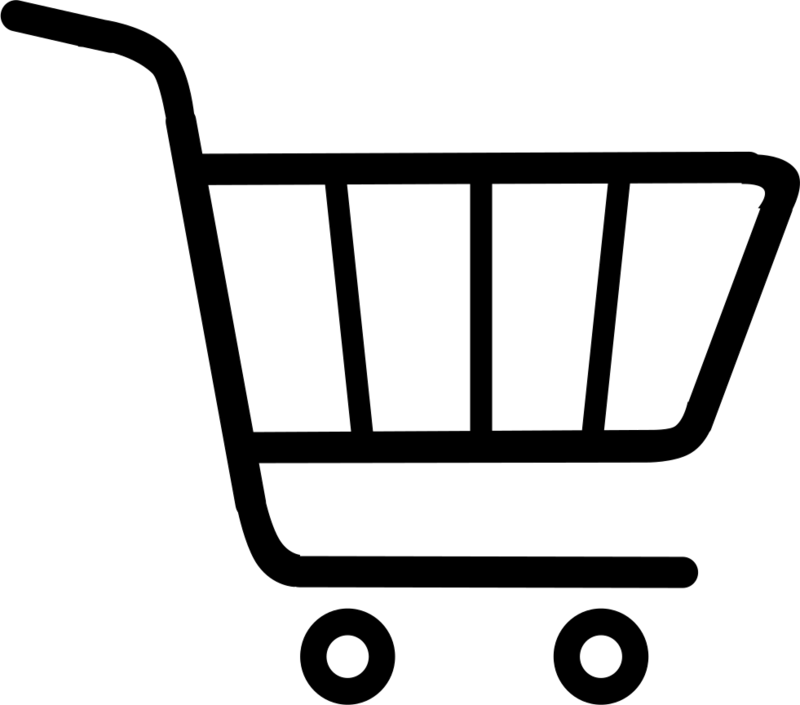 Please do not hesitate to contact us regarding your requirements. We look forward to being of service. All concrete elements are manufactured from sound concrete and free of structural defects. All concrete elements have an off-shutter finish on three sides, with the fourth side having a wood floated finish. A minimum cover of 12mm as per SABS 1372-1983 is maintained in all concrete elements. All elements shall retain the required shape and be true to the respective and specified dimensions as indicated in 2.1, 3.1 and 4.1. The required concrete compressive strength in all pre-fabricated elements shall be a minimum of 30 MPa at 28 days, determined in accordance with SANS 5836. All concrete elements shall be cured in accordance with the recommendations given in SANS5836. All reinforcing steel wires shall be free of rust, loose scale, flux, grease or oil substances. 2.1. 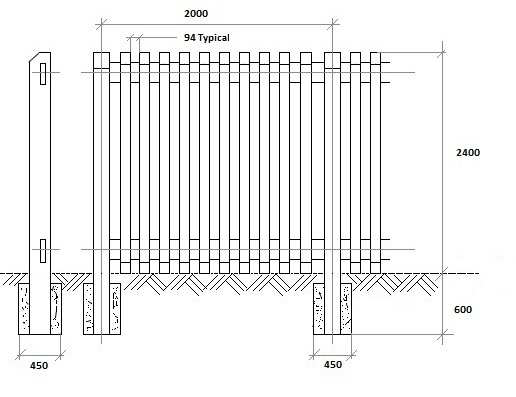 The post are 3.0m long and slotted, as per drawing, to take the horizontal load bearing rails. The back section is 140mm wide tapering to the front to 80mm. The thickness of the post shall be 225mm. 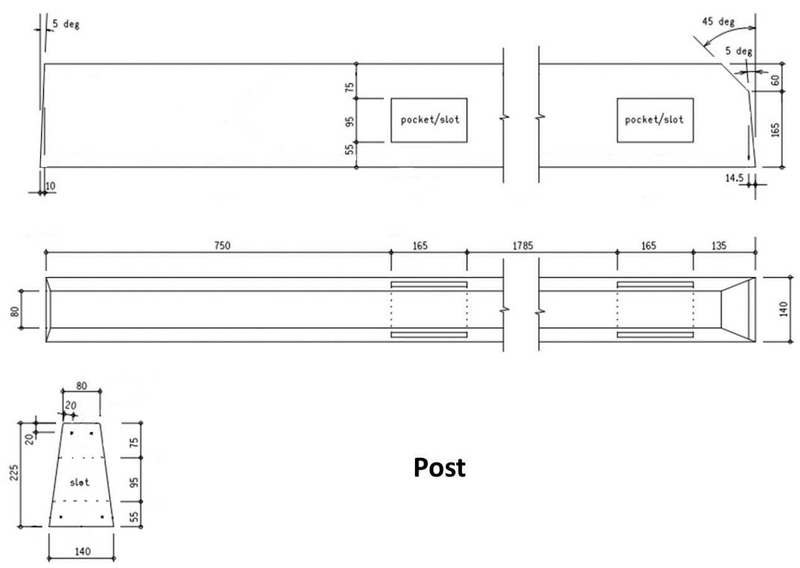 Posts shall be spaced at 2.0m centre in a concrete foundation. The top of the post is angled at 45°. 2.2. Each post contains four 4mm x 2900mm long carbon steel bars with high yield strength. 3.1. The pales are 2.4m long with two 10mm holes to take 8mm carriage type bolts. The back section is 100mm wide tapering to the front to 80mm. The thickness of the pales shall be 75mm. 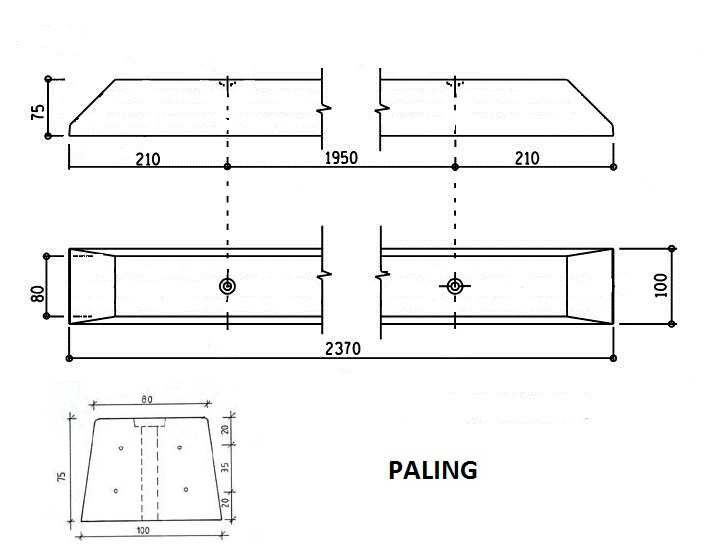 Pales are spaced at +/- 200mm centres and a total of 9 pales are installed per 2 meter section. 3.2. Each pale contains four 4mm x 2350mm long carbon steel bars with high yield strength. The top and bottom of the pales are angled at 45°. 4.1. 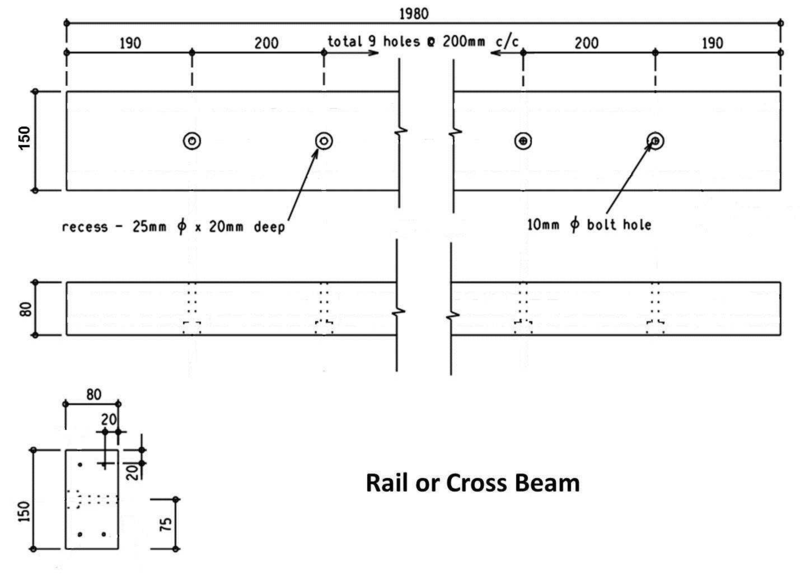 The rails are 1.98m long with nine x 10mm holes to take carriage 8mm type bolts. The rails shall be 150mm wide and 80mm deep. The rails slide into the posts and are grouted into posts with 2 to 1 sand/cement mix. 4.2. Each rail contains four 4mm x 1900mm long carbon steel bars with high yield strength. 5.1. All nuts, bolts and washers used for the erection of the fence are mild steel. Electrogalvanised (zinc and chrome) fasteners can be supplied as alternative (coastal application) at additional cost. 5.2. 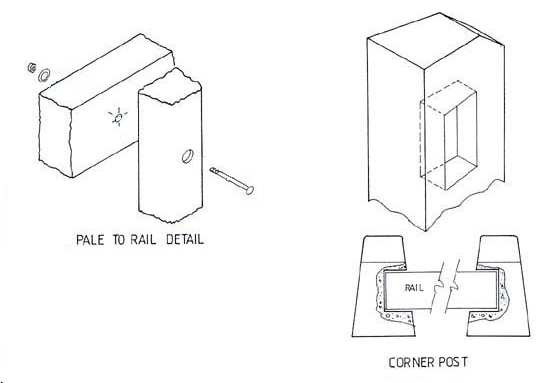 All bolts holes are filled with cement mortar and therefore negating the need for electrogalvanised fasteners. The grout comprises a 2 to 1 sand/cement mix. 6.1. 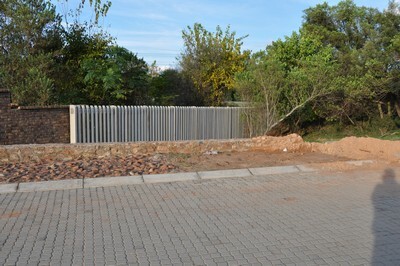 Each post is embedded in a concrete foundation hole of 450mm x 450mm and a depth of 600mm. 6.2. The sizes specified in par. 6.1 are for firm soils and it may be necessary to increase these sizes for softer yielding soils. 6.3. Foundation shall be a minimum of 15Mpa at 28 days.